Present Location: Wick, Littlehampton, West Sussex BN17 6JF. In your 1940's section regarding cinemas in Manchester you have missed out the finest of them all -- The Gaumont Theatre in Oxford Street. This beautiful cinema was the 'home' for many years of Stanley Tudor who not only entertained the audience during the intervals, but presented 'sing-a-longs' with the words of the tunes being shown on the screen so that the audience could could join in. This 'Showplace of the North' boasted in 1953 the largest Cinemascope screen in the north of England. I know as I was proud to present there 'How to Marry a Millionaire', whilst the Odeon across the road with a smaller screen ran 'The Robe'. The wonderful Wurlitzer Organ prior to the sad demolition of this grand theatre was reinstalled at the Granada Tour site, which is listed under your 1999 section. The Granada Tour enterprise has now closed as the area is required for further studio facilities. An update would be appreciated to your excellent website which I have just discovered. I remember the exterior of the Gaumont as 'Rotters' disco, a popular haunt for lads and ladettes in the 1970's. Today's NCP car park hardly recaptures the excitement and atmosphere of the Gaumont, and nobody walking past, as I did this evening, would have any idea of what a wonderful place the Gaumont was. But what about today's cinemas? The UGC multiplex cinema recently opened at Parrs Wood and it is very impressive inside and (at night) outside. Aren't these new state of the art multiplex cinemas the natural successors to the super-picture houses of 70 years ago? From or connections with: Kersal, Sedgley Park & Prestwich. Having just read your readers Eyewitness section I note that you intend to (at some future date) include photographs of Prestwich. I have a photo of the long since demolished Odeon Prestwich, (actually located at Sedgley Park) taken in the late 40's / early 50's. 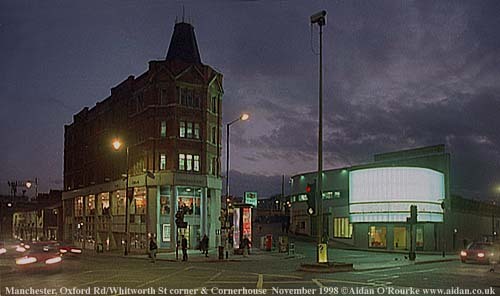 A cinema that I visited with my mother every Monday evening during the was and on a Saturday morning for the kids matinee for 6d with a 2d packet of crisps to eat on the way home with our macs flying in the wind and buttoned at the top only as we re-run the episode of 'Flash Gordan' we had just seen. Happy days. Your photograph of the Odeon Sedgeley Park (right) oozes the relaxed atmosphere of the late 40's early 50's (10 years before I was born!) - Bright sunshine, no traffic and an inviting looking programme, 'the best in screen entertainment' as the sign says. This is a place where many happy times were spent. Present Location: WICK, LITTLEHAMPTON, WEST SUSSEX. IN THE FORTHCOMING FEATURES/ FILMS ABOUT MANCHESTER SECTION YOU HAVE OMITTED IN MY OPINION ONE OF THE FINEST FILMS MADE. WITH THE SLOGAN 'THE FILM MADE IN SALFORD THAT MANCHESTER LOVES',AND OPENING AT THE DEANSGATE CINEMA IN 1953 WITH BIG QUEUES 'HOBSONS CHOICE' WAS A GREAT SUCCESS. OF INTEREST WAS THE FACT THAT WHEN JOHN MILLS TOOK BRENDA DE BANZIE COUURTING IN PEEL PARK THE USUALLY FILTHY, MURKY FOAM FLOATING RIVER IRWELL IN THE BACKGROUND WAS UNUSUALLY FAIRLY CLEAN ON THE DAY OF THE SHOOT. THE FILM CREW OFF CAMERA HAD TO POUR AND SWISH PACKETS OF WASHING POWDER AND FLAKES INTO THE RIVER TO CREATE THE MORE AUTHENTIC FOAMY WATERS. A GREAT FILM WITH GREAT PERFORMANCES FROM THE STARS INCLUDING CHARLES LAUGHTON AND A RATHER YOUNG AND PRE TESCO ADS PRUNELLA SCALES. NOT A FILM TO BE MISSED AND IF IT RETURNS TO TELEVISION A MUST FOR ALL MANCUNIANS. Thanks to you I have watched Hobson's Choice and it is indeed a superb film - very funny, very human and superbly acted all round. And of course from a historical point of view it has some amazing shots of Salford, the river Irwell and those cobbled back streets with children playing. The views of Peel Park and a hilltop view over Salford are all stunning. Amazing to think that the Salford of 1953 was to a great extent unchanged from the late 19th century, the era in which the story is set. Your picture (upper right) shows the Irwell further upstream with some foam caused by pollution. Present Location: Littlehampton, West Sussex. Re Frank Pearson of Charlotte, North Carolina. In his recent letter Frank brings up a subject dear to my heart - namely Manchester cinemas and in particular the Gaumont where I worked in the early fifties. I'll get to the Gaumont shortly, but first let's take a walk down Oxford Street in the 50's. Starting at St Peters Square and heading towards the Palace Theatre the first cinema on the left would be the Odeon, Originally opened in September 1930 as the Paramount. 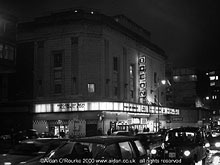 The Rank Organisation purchased this cinema along with many others from Paramount when a change in Government policy made the Paramount circuit non cost effective. Opposite the Odeon was the Manchester News Theatre which showed a collection of shorts, newsreels and cartoons in a programme that lasted one hour and was continuous from 10:00 in the morning. Not bad value for 9d (about 4 new pence - those were the days). Further down on the right was what Frank thought was the Tatler but was in fact the New Oxford, built I believe in the 1920's. This along with the Theatre Royal (1845),and the Gaiety (1884) in Peter Street was privately owned by Harry Buxton who I believe was the father of the Wimbledon tennis star Angela Buxton. Two shops away stood the Gaumont Theatre called this because it was a theatre licenced for cinematograph entertainment. 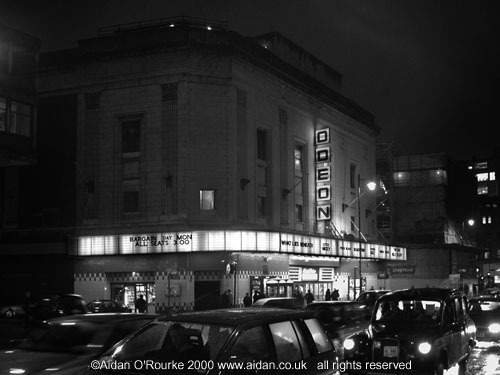 The New Oxford was used by the Rank Organisation I believe when the original Odeon was closed for conversion into the dreaded multi screen cinemas we live with today. The next cinema by the railway bridge at Oxford Road was the Tatler, a very luxurious news cinema with seats that you sank into.